George R. Doane and Eli Cady built several speculative homes in the neighbourhood, but perhaps none as elaborate as this, which cost $2,500, at the beginning of Victoria’s great land boom. Its 2½ storeys in the Foursquare style give it an imposing presence, emphasized by tall windows and corner boards, but the height is modulated by the full-width verandah, which wraps around one side. Wide drop-siding covers the main floor, while narrow double drop-siding is used above. The dormer in the hipped roof appears original, and the upper balcony shows in 1940s photographs, so may also be original. There’s no evidence of brackets or modillions, despite the wide eaves. The porch has fine spindle work and turned columns. An octagonal bay on the right side has a hipped roof, tied to the front porch with a belt course, and there’s a lean-to extension on the back. The front yard is dominated by a holly tree that must be as ancient as the house. The house was purchased in 1909 by Thomas Harry Slater, a retiree who lived at 1033 Pemberton. However, the first occupant was Thomas William Howard, manager of Northwest Real Estate Co, who was here by 1908. By then, builder George Doane was an employee of that company, an example of the convoluted relationship between builders and realtors during the boom years in Victoria’s housing market. Also typical of the fast market which could make and break men’s careers overnight, Cady and Doane had left Victoria by the end of 1911, and Howard had left both 1741 Duchess and Northwest Real Estate by 1917. The house was rented out, but frequently vacant until 1925, when Roland Ellis of Boswell, BC, who had held the mortgage since Howard had defaulted, took it over. 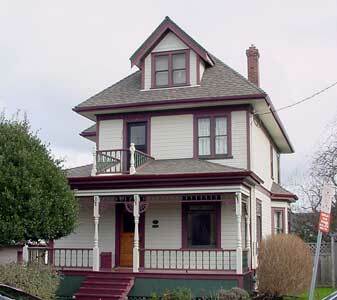 Ellis sold the property to John and Jessie Cotsford, but they continued to live at 1225 Sunnyside and rent this out. From about 1929-34, Sydney Fairclough Whitty (1876-1956) and his wife Alice Henrietta (Akenhead, 1886-1982) were the renters. Sydney was born in Liverpool, England, came to BC in 1918, and likely lived in Nanaimo, where Alice was born. They came to Victoria 10 years later. Sydney worked for Thomas-Bereton, manufacturers agents, until his retirement in 1941. John (1857-1946) and Jessie (Fotheringham, 1870-1944) Cotsford finally moved in themselves about 1934, and remained until 1943. John was a retired mariner born in Victoria, Jessie was born in St. Mary’s, ON, and came to Victoria c.1914. John served as a mate on the steamer Beaver and on the Cariboo Fly in the 1870s, and retired in 1914 after the pelagic sealing treaty was signed. He was then a boilermaker for several years. John was the son of Jonathan Cotsford, an HBC trader. He was also the grandson of West Coast pioneer John Dunn, who wrote History of the Oregon Territory in 1844. After several more owners and renters, William Norman Gray (1891-1984) and his wife Ethel Lansborough (Currie, 1892-1971) bought this house in 1945 with their daughter Phyllis. Bill and Ethel were born in Ontario, and lived in Blaine Lake, SK, for many years before coming to Victoria in 1945. Phyllis had come to Victoria in 1937 to train as a nurse at the Royal Jubilee Hospital (1900 Fort St, Jubilee). By 1945, she was assistant supervisor of the operating rooms, so the location on Duchess was convenient for her work. From 1951-54 Ethel boarded nurses taking post graduate work in the OR. Bill worked as a bookkeeper for a logging company at Leechtown. In 1959 Phyllis bought a farm in Sooke, and Bill and Ethel moved there to look after the farm. Their daughter, Jean, who married Melvin Gregory and worked as a telephone operator at the Jubilee Hospital, continued to live here. From 1973 to 1985 it was owned by the Hunter family, and then until 1994 by Finn and Margaret Madsen, who sold to the Wallace family. In the 1990s Jeff and Jane Wallace removed its later asbestos siding to reveal the original wooden siding. Their restoration work, which included all the turned and sawn ornamentation, won for them top awards from local and provincial heritage organizations.